Sometimes our appetites are bigger than our cooking space. Have you ever tried prepping Thanksgiving dinner in an RV? It’s a small nightmare. But what’s a family to do if they’re living on the road over the holidays? Or what do you do if you’re hangry after a day of hunting, mountaineering, or crushing books for finals? Just because your food prep is limited by space, doesn’t mean your meals need to be limited in creativity and flavor. With a few staples on stand-by, and by planning ahead, you can kiss that cup ‘o’ noodle farewell, and say hello to tasty freeze dried meals, one-pot wonders, or muffins in a cup! 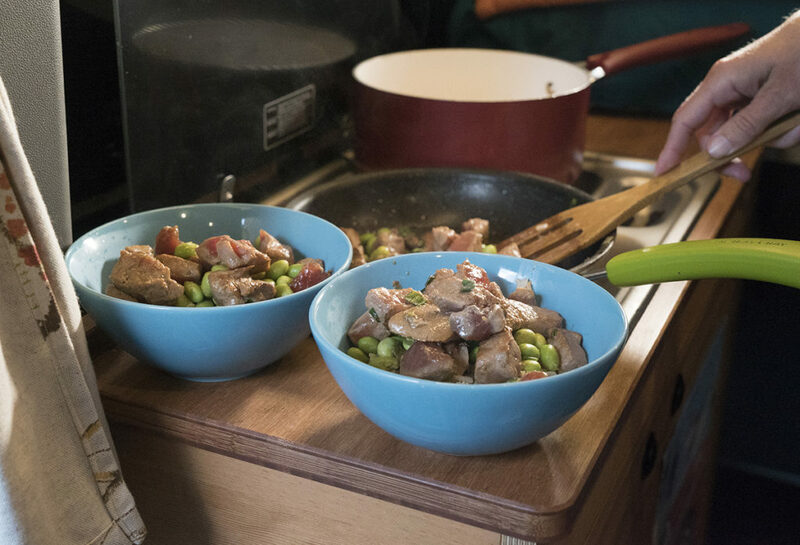 Here are some recipes that’ll keep your belly full and your dishes few, from dorm room to van life to the backcountry. Though tempting, you probably won’t want to eat your weight in fried chicken from the student union every night, so step up to the hot plate and make the roomie drool in envy. A few Mountain House meals in the cupboard will quickly curb that 12:30am stomach growl (just add hot water!). And for breakfast, how about a cookie … in a cup! This super simple recipe involves only 6 ingredients. With 5 shelf-stable ingredients, you won’t take up precious room in your mini-fridge, and all together, you’ll only spend 6 minutes mixing and cooking this nutritious breakfast. 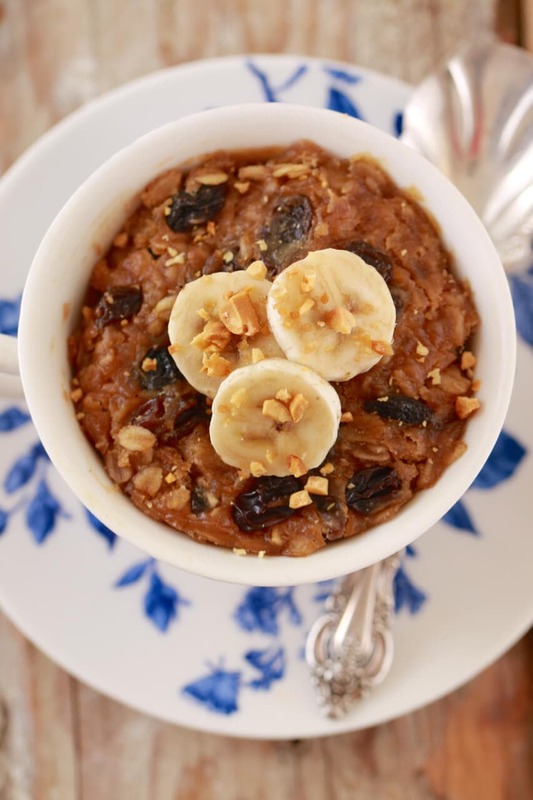 The oats keep you full until lunch, the peanut butter provides healthy fats for an immediate fix, and the banana gives a bit of natural sweetness. Find the full recipe here. Study date? 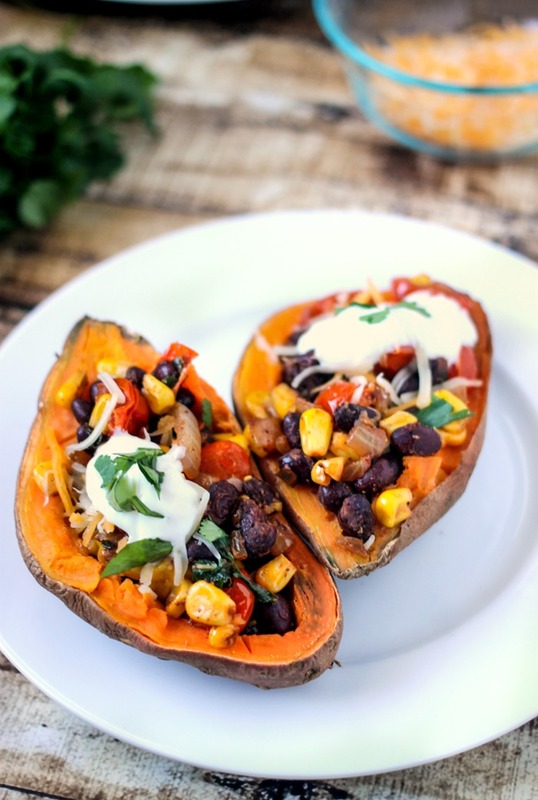 Impress with this super simple vegetarian-friendly recipe for Southwestern Stuffed Sweet Potatoes, perfect for lunch or dinner in the dorm room. A few low-cost fresh ingredients plus some shelf stable basics (beans and corn) and 15 minutes later you’ve earned a degree in hunger-management! Find the full recipe here. With the #vanlife movement sweeping the nation, folks are downsizing the stuff and upsizing the experience! Whether you go full-time with a home on wheels, or just dabble in the mobile lifestyle, you’re definitely not going to want to downsize the quality of your dining! 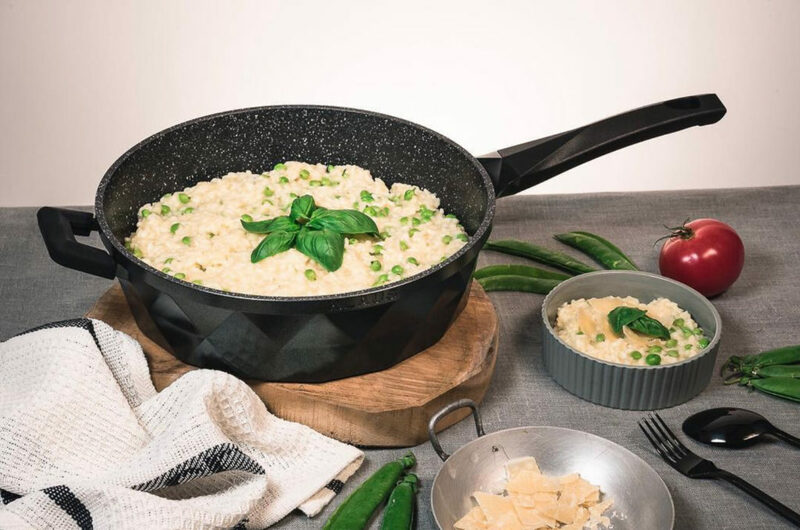 While some vans have an elaborate kitchen, most get by with a hot plate or two-burner stove, so one-pot meals are a must. Easy clean-up, short cook time, and minimal ingredients. Sounds delicious! Who says you can’t be fancy in a van? With only five ingredients, this one-pot meal fills a belly but not the cupboard space, plus it only takes about thirty minutes to make. Tip: swap out the peas with mushrooms or add prosciutto! Find the full recipe here. Chances are, if you’re lucky enough to have a life on wheels, you also have a small refrigerator that comes with you! Pick up a pound or so of raw ahi tuna from your local fish market and mix up a marinade (we like to keep it simple with a combination of soy sauce and Sriracha!). Cut the ahi into one inch chunks and let it sit in the marinade for as many miles as it takes until your stomach begins to growl. When you’re ready to park and eat, put a pot on the stovetop for rice (or just heat up pre-cooked rice). If you only have one burner, remove the rice from the heat when done and set aside. Heat a skillet over medium high heat. Add the ahi chunks all at once, searing quickly on each side. Remove from heat while the ahi is still pink on the inside. Layer the ahi over bowls of rice. Top with shelled edamame and crumbled seaweed crisps. Off the grid means off the clock, and there’s no better time to let dinner simmer and stew for hours on end then when you’re at hunt camp or exploring the backcountry. You only need a dutch oven and a handful of ingredients for this super easy wood stove beef stew. 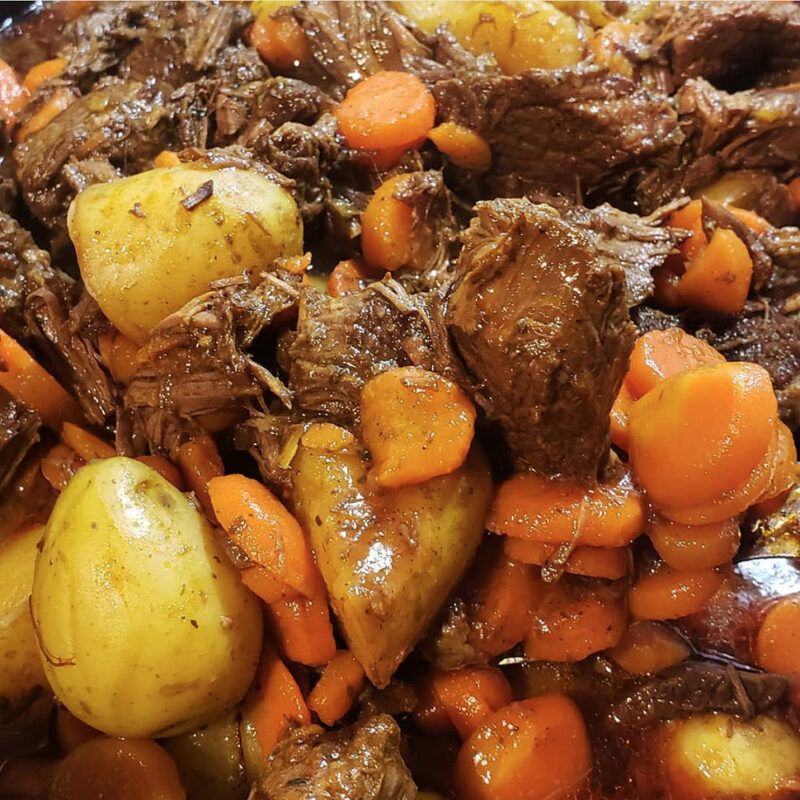 Pre-warm the dutch oven, dredge the beef in flour, fry on all sides to sear in the juices, then add chunks of potatoes, carrots, onions, wine, and spices. After 6 hours at a simmer, you’ll have a hearty and delicious meal that will satisfy the hungriest of hunters. Find the full recipe here. Of course, we’re pretty big fans of our Mountain House meals, and we know we’re not the only ones who like to take tried and true Mountain House favorites (like Chicken and Rice) and adding our own “hacks” (see #MHHacks on Instagram for ideas!). 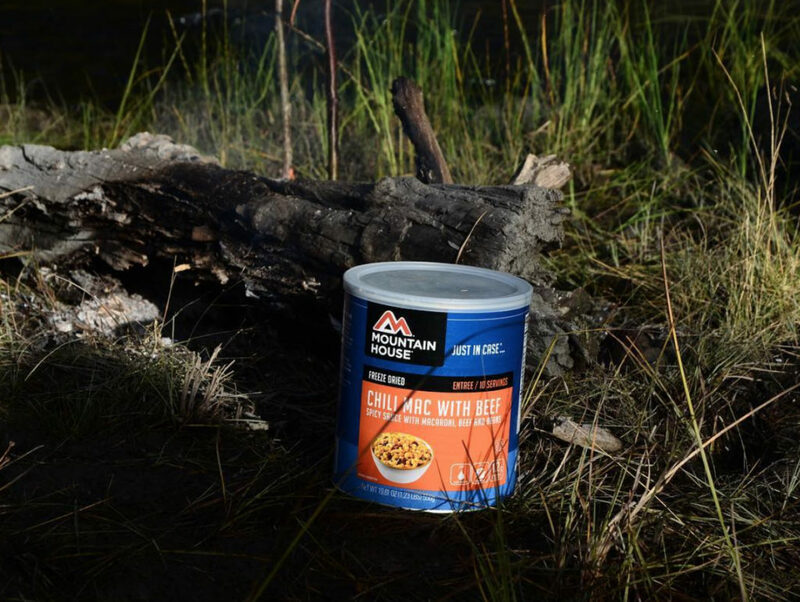 After a long day trekking and scouting, the allure of a just-add-water meal can be pretty darn appealing. So on the days when the wood stove stew just isn’t in the game plan (see what we did there?) boil some water to heat up your favorite Mountain House meal. Then add in some fresh-caught fish or game, fresh veggies, or corn chips (because Fritos plus Chili Mac = heaven). This entry was posted in General and tagged #MHhacks, backcountry, dorm life, hunting, recipes, van life by Kelli Martinelli. Bookmark the permalink.